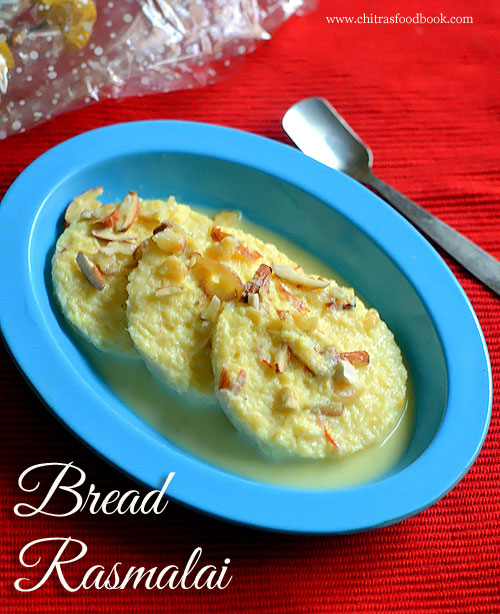 Bread Rasmalai is an easy to make, instant rasmalai recipe. Even though its taste and texture cannot be compared with the authentic, traditional rasmalai prepared with rasgulla, it can satisfy our sweet cravings quickly. It takes very less time to prepare. Also it an yummy sweeet recipe that can be prepared using leftover bread slices. Kids would love it for sure. Last week I made it using some left over dry bread slices at home. As I had already shared an instant rasmalai recipe using store bought rasgolla and condensed milk, I did not use condensed milk in this recipe. I just used sugar, nuts and prepared rabri in its usual method. 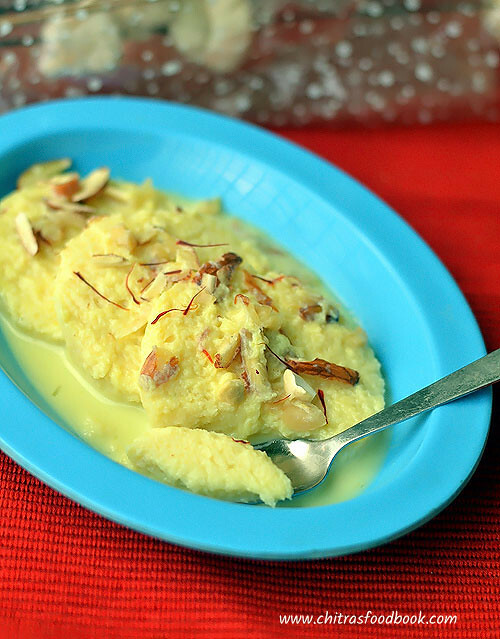 This bread rasmalai tastes the best when served chilled. Friends, you can try this easy rasmalai recipe with bread for your kids and family to serve a quick dessert for an occasion or weekends. 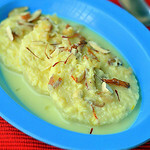 Ok, lets see how to make bread rasmalai recipe with step by step pictures and video. Check out my gulab jamun and shahi tukda. Take milk in a wide pan and boil till it reduces to 1.5 cups. Add sugar, chopped nuts, cardamom, saffron. Boil till it reduces to 1 cup. Rabri is ready. Switch off and keep aside. Take bread slices and cut into round shape using a lid. Dip the bread in rasmalai. Remove in a plate and garnish with nuts. Refrigerate for an hour and serve chilled for best taste. Heat 2 cups of milk in a wide kadai. Boil till it reduces to 1.5 cups. Scrape the sides, collect the skin and add it back to the kadai while the milk boils. Stir at regular intervals to avoid over flowing. After the milk is reduced, add sugar, chopped nuts, saffron threads and cardamom powder.Mix well, .Boil till milk reduces to 1 cup. So total milk should be half the quantity of original measure. Now check the taste. Add more sugar if needed and mix well. When you pour the milk, it should be slightly thick. Remove from the flame and let it become warm. Milk becomes thicker when it cools down.So do not reduce it too much. Now take the bread slices. Cut into round shape with a lid.Remove the sides. Dip the bread slice in thickened milk. Pour some thick milk over the bread. Remove in a plate. Garnish with chopped nuts.Refrigerate for an hour and serve chilled. Do not use very dry and old bread.Using fresh bread is also not advisable because it may dissolve in milk due to its softness. Use 2 days old bread for best taste. Adjust the quantity of sugar as per taste. You can also add at the end before dipping bread slices to increase the sweetness. 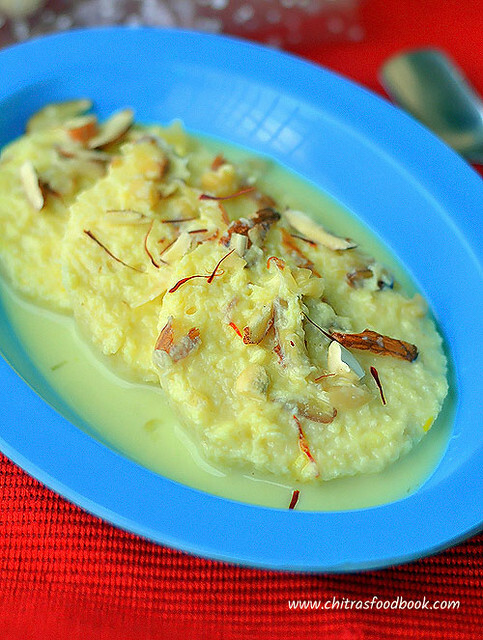 Try this easy, instant bread rasmalai and enjoy a quick dessert at home !